Lev Davidovich Trotsky burst onto the world stage in November 1917 as coleader of a Marxist Revolution seizing power in Russia. It made him one of the most recognized personalities of the twentieth century, a global icon of radical change. Yet just months earlier, this same Lev Trotsky was a nobody, a refugee expelled from Europe, writing obscure pamphlets and speeches, barely noticed outside a small circle of fellow travelers. Where had he come from to topple Russia and change the world? Where else? 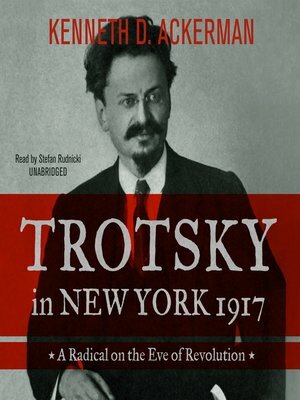 New York City.Between January and March 1917, Trotsky found refuge in the United States. America had kept itself out of the European Great War, leaving New York the freest city on earth. During his time there—just over ten weeks—Trotsky immersed himself in the local scene. He settled his family in the Bronx, edited a radical left wing tabloid in Greenwich Village, sampled the lifestyle, and plunged headlong into local politics. His clashes with leading New York socialists over the question of US entry into World War I would reshape the American left for the next fifty years.